In this Ottoman Turkish style name, Ismail Enver is the given name, the title is Pasha, and there is no family name. Ismail Enver Pasha (Ottoman Turkish: اسماعیل انور پاشا‎; Turkish: İsmail Enver Paşa; 22 November 1881 – 4 August 1922) was an Ottoman military officer and a leader of the 1908 Young Turk Revolution. He became the main leader of the Ottoman Empire in both the Balkan Wars (1912–13) and in World War I (1914–18). In the course of his career he was known by increasingly elevated titles as he rose through military ranks, including Enver Efendi (انور افندي‎), Enver Bey (انور بك‎), and finally Enver Pasha, "pasha" being the honorary title Ottoman military officers gained on promotion to the rank of Mirliva (major general). After the Ottoman coup d’état of January 1913, Enver Pasha became (4 January 1914) the Minister of War of the Ottoman Empire, forming one-third of the triumvirate known as the "Three Pashas" (along with Talaat Pasha and Djemal Pasha) who held de facto rule over the Empire from 1913 until the end of World War I in 1918. As war minister and de facto Commander-in-Chief (despite his role as the de jure Deputy Commander-in-Chief, as the Sultan formally held the title), Enver Pasha was the most powerful figure of the government of the Ottoman Empire. He decided to involve the Empire in World War I on the side of Germany. Along with Talaat and Djemal, he was one of the principal perpetrators of the Armenian Genocide and thus is held responsible for the death of between 800,000 and 1,800,000 Armenians. Enver (left) with his father, Ahmed Bey (center), and half-brother Nuri Pasha (later Nuri Killigil; right). Enver was born in Istanbul on 22 November 1881. Enver's father, Ahmed (c. 1860–1947), was a Gagauz Turk either a bridge-keeper in Monastir or a small town public prosecutor in the Balkans and his mother Ayşe, an Albanian. His uncle was Halil Pasha (later Kut). Enver had two younger brothers, Nuri and Mehmed Kamil, and two younger sisters, Hasene and Mediha. He was the brother in law of Lieutenant Colonel Ömer Nâzım. He studied for different degrees in military schools in the empire and ultimately graduated from the Harp Akademisi with distinction in 1903. He became a major general in 1906. He was sent to the Third Army, which was stationed in Salonica. During his service in the city, he became a member of the Committee of Union and Progress (CUP). Enver Pasha depicted on a Young Turks flyer with the slogan "Long live the fatherland, long live the nation, long live liberty" written in Ottoman Turkish and French. Enver, through the assistance of his uncle Halil Kut became the twelfth member of the Ottoman Freedom Society (OFS) while the organisation was still at an early phase of development. The OFS merged later with the Paris-based group of Ahmed Rıza to create the Committee of Union and Progress (CUP). The CUP gained access to the Ottoman Third Army through Enver. In 1906 upon returning to Monastir (modern Bitola) Enver formed a CUP cell within the town and worked closely with an Ottoman officer Kâzım Karabekir. Enver became the main figure in the CUP Monastir branch and he initiated Ottoman officers like Ahmet Niyazi bey and Eyüp Sabri into the CUP organisation. In the early twentieth century some prominent Young Turk members such as Enver developed a strong interest in the ideas of Gustave Le Bon. For example, Enver saw deputies as mediocre and in reference to Le Bon he thought that as a collective mind they had the potential to become dangerous and be the same as a despotic leader. As the CUP shifted away from the ideas of members who belonged to the old core of the organisation to those of the newer membership, this change assisted individuals like Enver in gaining a larger profile in the Young Turk movement. In Ohri (modern Ohrid) an armed band called the Special Muslim Organisation (SMO) composed mostly of notables was created in 1907 to protect local Muslims and fight Internal Macedonian Revolutionary Organization (IMRO) bands. Enver along with Sabri recruited the SMO and turned it into the Ohri branch of the CUP with its band becoming the local CUP band. CUP Internal headquarters proposed that Enver go form a CUP band in the countryside. Approving the decision by the committee to assassinate his brother in law Lieutenant Colonel Ömer Nâzım, Enver under instructions from CUP headquarters traveled from Selanik (modern Thessaloniki) to Tikveş on 26 June 1908 to establish a band. CUP headquarters conferred upon Enver the title of "CUP Inspector General of Internal Organisation and Executive Forces". On July 3 1908 Niyazi protesting the rule of Abdul Hamid II fled with his band from Resne (modern Resen) into the mountains where he initiated the Young Turk Revolution and issued a proclamation that called for the restoration of the constitution of 1876. Following that example other officers like Enver in Tikveş and Sabri in Ohri also went into the mountains and formed guerilla bands (çetes). It is unclear whether the CUP had a fixed date for the revolution and in comments made in an interview following the event Enver stated that they planned for action on August 1908, yet events had forced them to begin the revolution at an earlier time. For the revolt to get local support Enver and Niyazi played on fears of possible foreign intervention. Enver led a band composed of volunteers and deserters. For example, he allowed for a deserter that had engaged in brigandage in areas west of the river Vardar to join his band at Tikveș. Throughout the revolution, guerilla bands of both Enver and Niyazi were Muslim (mostly Albanian) paramilitaries. Enver sent an ultimatum to the Inspector General on 11 July 1908 and demanded that within 48 hours Abdul Hamid II issue a decree for CUP members that had been arrested and sent to Istanbul to be freed. He stated that if the ultimatum was not complied with by the Inspector General, Enver warned that he refused to accept any responsibility for future actions. In Tikveș a handwritten appeal was distributed to locals calling for them to either stay neutral or join with him. Enver possessed strong authority among fellow Muslims in the area where he resided and could communicate with them as he spoke both Albanian and Turkish. During the revolution, Enver stayed in the homes of notables and as a sign of respect they would kiss his hands as he had earlier saved them from an attack by an IMRO band. He stated that the CUP had no support in the countryside apart from a few large landowners with CUP membership that lived in towns, yet they retained influence in their villages and were able to mobilise the population for the cause. Whole settlements were enrolled into the CUP through councils of village elders convened by Enver in Turkish villages of the Tikveş region. As the revolution spread by the third week and more officers deserted the army to join the cause, Enver and Niyazi got like minded officials and civilian notables to send multiple petitions to the Ottoman place. Enver wrote in his memoirs that while he still was involved in band activity in the days toward the end of the revolution he composed more detailed rules of engagement for use by paramilitary units and bands. Ottoman poster celebrating the 1908 revolution. Enver is depicted in the lower right hand corner with a large hammer freeing Liberty personified as a women from her chains. 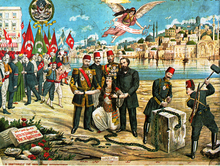 Facing a deteriorating situation in the Balkans on July 24 sultan Abdul Hamid II restored the constitution of 1876. In the aftermath of the revolution Niyazi and Enver remained in the political background due to their youth and junior military ranks with both agreeing that photographs of them would not be disturbed to the general public, yet this decision was rarely observed. Instead Niyazi and Enver as leaders of the revolution elevated their positions into near legendary status with their images placed on postcards and distributed throughout the Ottoman state. Toward the latter part of 1908, photographs of Niyazi and Enver had reached Istanbul and school children of the time played with masks on their faces that depicted the revolutionaries. In other images produced of the time the sultan is presented in the centre flanked by Niyazi and Enver to either side. As the actions of both men carried the appearance of initiating the revolution, Niyazi, an Albanian and Enver, a Turk later got popular acclaim as "heroes of freedom" (hürriyet kahramanları) and symbolised Albanian-Turkish cooperation. As a tribute to his role in the Young Turk Revolution that began the Second Constitutional Era of the Ottoman Empire, Niyazi is mentioned along with Enver in the March of the Deputies (Turkish: Mebusan Marşı or Meclis-i Mebusan Marşı), the anthem of the Chamber of Deputies, the lower house of the Ottoman parliament. It was performed in 1909 upon the opening of the parliament. The fourth line of the anthem reads "Long live Niyazi, long live Enver" (Turkish: "Yaşasın Niyazi, yaşasın Enver"). The Ottoman newspaper Volkan, a strong supporter of the constitution published adulatory pieces about Enver and Niyazi in 1909. Following the revolution Enver rose within the ranks of the Ottoman military and he had an important role within army committee relations. By 1909 he was the military attaché at Berlin and formed personal ties with high ranking German state officials and the Kaiser. It was during this time that Enver came to admire the culture of Germany and power of the German military. He invited German officers to reform the Ottoman Army. In 1909 a reactionary conspiracy to organize a countercoup culminated in the "31 March Incident", which was put down. Enver for a short time in April 1909 returned to Istanbul and joined the Hareket Ordusu (Army of Action). As such he took an active role in the suppression of the countercoup which resulted in the overthrow of Abdul Hamid II and replacement with his brother Mehmed V while the power of the CUP was consolidated. Throughout the Young Turk era, Enver was a member of the CUP central committee from 1908 to 1918. Enver Bey in Libya during the Italo-Turkish War, 1911–12, wearing the style of hat named "Enveriye" after him. Enver Bey (center) talking to the British attaché and press in Constantinople immediately after seizing power in the 1913 Raid on the Sublime Porte, also known as the 1913 Ottoman coup d'état. In October 1912, the First Balkan War broke out, where the Ottoman armies suffered severe defeats at the hands of the Balkan League. These military reversals weakened the government, and gave Enver his chance to grab for power from the Liberal Union. In a coup in January 1913, he returned power to the CUP from the Liberal Union and introduced a triumvirate that came to be called the "Three Pashas" (Enver Pasha, Talaat Pasha, and Djemal Pasha). He took the office as Minister of War. In 1914, he was again Minister of War in the cabinet of Said Halim Pasha, and married HIH Princess Emine Naciye Sultan (1898–1957), the daughter of Prince Süleyman, thus entering the royal family as a damat ("bridesgroom" to the ruling House of Osman). His power grew steadily while Europe marched towards total war. He then left the peace negotiations then under way in London. The renewed hostilities only worsened the Empire's situation, however, as the two major remaining strongholds of Adrianople (Edirne) and Yannina fell to the Bulgarians and the Greeks, respectively, forcing the Ottomans to concede defeat at the Treaty of London. After taking office in 1913, Enver proved ineffective as War Minister, and frequently over the next four years, the Germans had to support the Ottoman government with generals such as Otto Liman von Sanders, Erich von Falkenhayn, Colmar Freiherr von der Goltz, and Friedrich Freiherr Kress von Kressenstein. The Germans also gave the Ottoman government military supplies and fuel. After his defeat at Sarıkamısh, Enver returned to Istanbul (Constantinople) and took command of the Turkish forces around the capital. He was confident that the capital was safe from any Allied attacks. The British and French were planning on forcing the approaches to Constantinople in the hope of knocking the Ottomans out of the war. A large Allied fleet assembled and staged an attack on the Dardanelles on 18 March 1915. The attack (the forerunner to the failed Gallipoli campaign) was a disaster, resulting in the loss of several ships. As a result, Enver turned over command to Liman von Sanders, who led the successful defence of Gallipoli, along with Mustafa Kemal. Enver then left to attend to pressing concerns on the Caucasus Front. Later, after many towns on the peninsula had been destroyed and women and children killed by the Allied bombardment, Enver proposed setting up a concentration camp for the remaining French and British citizens in the empire. Henry Morgenthau, the American ambassador to the Ottoman Empire, convinced Enver not to go through with this plan. Enver's plan for Falkenhayn’s Yildirim Army Group was to retake Baghdad, recently taken by Maude. This was nearly impossible for logistical reasons. Turkish troops were deserting freely, and when Enver visited Beirut in June 1917, soldiers were forbidden to be stationed along his route for fear that he would be assassinated. Lack of rolling stock meant that troops were often detrained at Damascus and marched south. During 1917, due to the Russian Revolution and subsequent Civil War, the Russian army in the Caucasus had ceased to exist. At the same time, the Committee of Union and Progress managed to win the friendship of the Bolsheviks with the signing of the Ottoman-Russian friendship treaty (1 January 1918). Enver looked for victory when Russia withdrew from the Caucasus region. When Enver discussed his plans for taking over southern Russia, he ordered the creation of a new military force called the Army of Islam which would have no German officers. Enver's Army of Islam avoided Georgia and marched through Azerbaijan. The Third Army under Vehib Pasha was also moving forward to pre-war borders and towards the First Republic of Armenia, which formed the frontline in the Caucasus. General Tovmas Nazarbekian was the commander on the Caucasus front, and Andranik Ozanian took the command of Armenia within the Ottoman Empire. The Ottoman advance was halted at the Battle of Sardarabad. However, after the Armistice of Mudros between Great Britain and the Ottoman Empire on 30 October, Ottoman troops were obliged to withdraw and replaced by the Triple Entente. These conquests in the Caucasus counted for very little in the war as a whole but they did however ensure that Baku remained within the boundaries of Azerbaijan while a part of Soviets and later as an independent nation. Enver Pasha in Batumi in 1918. At Baku, Enver Pasha put in a sensational appearance. A whole hall full of Orientals broke into shouts, with scimitars and yataghans brandished aloft: 'Death to imperialism" All the same, genuine understanding with the Islamic world...was still difficult. Enver and Mustafa Kemal at European manoeuvres, 1910. Much has been written about the poor relations between Enver and Mustafa Kemal, two men who played pivotal roles in the Turkish history of the 20th century. Both hailed from the Balkans, and the two served together in North Africa during the wars preceding World War I, Enver being Mustafa Kemal's senior. Enver disliked Mustafa Kemal for his circumspect attitude toward the political agenda pursued by his Committee of Union and Progress, and regarded him as a serious rival. Mustafa Kemal (later known as Atatürk) considered Enver to be a dangerous figure who might lead the country to ruin; he criticized Enver and his colleagues for their policies and their involvement of the Ottoman Empire in World War I. In the years of upheaval that followed the Armistice of October 1918, when Mustafa Kemal led the Turkish resistance to occupying and invading forces, Enver sought to return from exile, but his attempts to do so and join the military effort were blocked by the Ankara government under Mustafa Kemal. A portrait of Enver Pasha. Enver Pasha's grave at the Abide-i Hürriyet (Monument of Liberty) cemetery in Istanbul, where his remains were interred in 1996. Enver's body was buried near Ab-i-Derya. In 1996, his remains were brought to Turkey and reburied at Abide-i Hürriyet (Monument of Liberty) cemetery in Şişli, Istanbul. Enver's image remains controversial in Turkey, since there are those who blame him for the Ottoman entrance into World War I and the subsequent collapse of the Empire. After Enver's death, three of his four siblings, Nuri (1889–1949), Mehmed Kamil (1900–62), and Hasene Hanım, adopted the surname "Killigil" after the 1934 Surname Law required all Turkish citizens to adopt a surname. Enver's sister Hasene Hanım married Nazım Bey. Nazım Bey, an aid-de-camp of Abdul Hamid II, survived an assassination attempt during the 1908 Young Turk Revolution of which his brother-in-law Enver was a leader. With Nazım, Hasene gave birth to Faruk Ken�� (1910–2000), who would become a famous Turkish film director and producer. Enver's other sister, Mediha Hanım (later Mediha Orbay; 1895–1983), married Kâzım Orbay, a prominent Turkish general and politician. On 16 October 1945, their son Haşmet Orbay, Enver's nephew, shot and killed a physician named Neşet Naci Arzan, an event known as the "Ankara murder". At the urging of the Governor of Ankara, Nevzat Tandoğan, Haşmet Orbay's friend Reşit Mercan initially took the blame. After a second trial revealed Haşmet Orbay as the perpetrator, however, he was convicted. The murder became a political scandal in Turkey after the suicide of Tandoğan, the suspicious death of the case's public prosecutor Fahrettin Karaoğlan, and the resignation of Kâzım Orbay from his position as Chief of the General Staff of Turkey after his son's conviction. ^ Freedman, Jeri (2009). The Armenian Genocide (1st ed.). New York: Rosen Pub. ISBN 978-1-40421825-3. Enver Pasha, Mehmet Talat, and Ahmed Djemal were the three men who headed the CUP. They ran the Ottoman administration during World War I and planned the Armenian genocide. ^ Forsythe, David P. (11 August 2009). Encyclopedia of human rights (Google Books). Oxford University Press. p. 98. ISBN 978-0-19-533402-9. ^ Asia and the Americas. 18. 1918. p. 923. ^ Kaylan, Muammer (2005), The Kemalists: Islamic Revival and the Fate of Secular Turkey, Prometheus Books, p. 75 . ^ Akmese, Handan Nezir (2005), The Birth of Modern Turkey: The Ottoman Military and the March to WWI, IB Tauris, p. 44 . ^ Mazower, Mark (2004), Salonica, City of Ghosts: Christians, Muslims and Jews 1430–1950, HarperCollins, p. 255 . ^ a b c d Hanioğlu 2001, p. 266. ^ a b c d e Zürcher 2014, p. 35. ^ Kansu 1997, p. 90. ^ Hanioğlu 2001, pp. 308, 311. ^ Hanioğlu 2001, p. 311. ^ Hanioğlu 2001, p. 291. ^ a b Hanioğlu 2001, p. 225. ^ a b Hanioğlu 2001, pp. 226. ^ a b Özen, Saadet (2017). "The Heroes of Hürriyet: The images in Struggle". In Lévy-Aksu, Noémi; Georgeon, François (eds.). The Young Turk Revolution and the Ottoman Empire: The Aftermath of 1918. I.B.Tauris. p. 31. ISBN 9781786720214. ^ a b Başkan, Birol (2014). From Religious Empires to Secular States: State Secularization in Turkey, Iran, and Russia. Routledge. p. 51. ISBN 9781317802044. ^ Hale 2013, p. 35. ^ Hanioğlu 2001, p. 262. ^ Gawrych 2006, p. 150. ^ a b c d Hanioğlu 2001, p. 268. ^ Gingeras, Ryan (2014). Heroin, Organized Crime, and the Making of Modern Turkey. Oxford University Press. p. 28. ISBN 9780198716020. ^ Hanioğlu 2001, p. 228, 452. "Enver Bey's mother was from a mixed Albanian-Turkish family, and he could communicate in Albanian." ^ Hanioğlu 2001, p. 228. ^ a b Zürcher, Erik Jan (2014). The Young Turk Legacy and Nation Building: From the Ottoman Empire to Atatürk's Turkey. I.B.Tauris. pp. 38–39. ISBN 9780857718075. ^ Gingeras 2016, p. 33. ^ Bilici 2012, para. 26. ^ Hanioğlu 2001, p. 275. ^ Hale, William (2013). Turkish Politics and the Military. Routledge. p. 38. ISBN 9781136101403. ^ Gingeras, Ryan (2016). Fall of the Sultanate: The Great War and the End of the Ottoman Empire 1908-1922. Oxford University Press. p. 34. ISBN 9780191663581. ^ Bilici 2012, para. 25. ^ Özen 2017, p. 28. ^ Gawrych, George (2006). The Crescent and the Eagle: Ottoman rule, Islam and the Albanians, 1874–1913. London: IB Tauris. pp. 150, 169. ISBN 9781845112875. ^ Zürcher, Erik Jan (1984). The Unionist Factor: The Role of the Committee of Union and Progress in the Turkish National Movement 1905-1926. Brill. p. 44. ISBN 9789004072626. ^ a b Güçlü, Yücel (2018). The Armenian Events Of Adana In 1909: Cemal Pasa And Beyond. Rowman & Littlefield. p. 121. ISBN 9780761869948. ^ a b c Böke, Pelin; Tınç, Lütfü (2008). Son Osmanlı Meclisi'nin son günleri [The last days of the last Ottoman Assembly]. Doğan Kitap. p. 22. ISBN 9789759918095. ^ Bilici, Faruk (2012). "Le révolutionnaire qui alluma la mèche: Ahmed Niyazi Bey de Resne [Niyazi Bey from Resne: The Revolutionary who lit the Fuse]". Cahiers balkaniques. 40. para. 27. ^ Vahide, Şükran (2005). Islam in Modern Turkey: An Intellectual Biography of Bediuzzaman Said Nursi. State University of New York Press. p. 69. ISBN 9780791482971. ^ a b c d e f Yılmaz, Șuhnaz (2016). "Revisiting Netwrosk and Narratives: Enver Pasha's Pan-Islamic and Pan-Turkic Quest". In Moreau, Odile; Schaar, Stuart (eds.). Subversives and Mavericks in the Muslim Mediterranean: A Subaltern History. University of Texas Press. p. 144. ISBN 9781477310939. ^ Hanioğlu, M. Șükrü (2001). Preparation for a Revolution: The Young Turks, 1902-1908. Oxford University Press. p. 216. ISBN 9780199771110. ^ Hakyemezoğlu, Serdar, Buhara Cumhuriyeti ve Enver Paşa (in Turkish), Ezberbozanbilgiler, retrieved 24 June 2011 . ^ Enver Paşa Makalesi (in Turkish), Osmanlı Araştırmaları Sitesi . ^ a b Fromkin, David (2001). A Peace to End All Peace: The Fall of the Ottoman Empire and the Creation of the Modern Middle East. New York: H. Holt. p. 119. ISBN 0-8050-6884-8. ^ Derogy, Jacques. Resistance and Revenge, p. 12 Published 1986, Transaction Publishers. ISBN 0-88738-338-6. ^ Balakian, Peter. The Burning Tigris, p. 184. Published 2003, HarperCollins. ISBN 0-06-019840-0. ^ Akcam, Taner. A Shameful Act, p. 143. Published 2006, Henry Holt & Co. ISBN 0-8050-7932-7. ^ Moorehead 1997, p. 79. ^ Moorehead 1997, p. 166–68. ^ Woodward 1998, pp. 160–1. ^ Refuting Genocide, U Mich, archived from the original on 4 April 2002 . ^ a b Wheeler-Bennett, John (1967), The Nemesis of Power, London: Macmillan, p. 126 . ^ Moorehead 1997, p. 300. ^ Serge, Victor (1984). emoirs of a Revolutionary. New York: Writer and Readers Publishing Inc. p. 109. ISBN 0 86316 070 0. ^ a b Kaylan, Muammer. The Kemalists: Islamic Revival and the Fate of Secular Turkey. Prometheus Books. p. 77. ISBN 978-1-61592-897-2. ^ a b Zürcher, Erik Jan (1 January 1984). The Unionist Factor: The Rôle [sic] of the Committee of Union and Progress in the Turkish National Movement, 1905–1926. Brill. p. 59. ISBN 90-04-07262-4. ^ Harris, George Sellers; Criss, Bilge (2009). Studies in Atatürk’s Turkey: The American Dimension. Brill. p. 85. ISBN 90-04-17434-6. ^ Rubin, Barry M; Kirişci, Kemal (1 January 2001). Turkey in World Politics: An Emerging Multiregional Power. Lynne Rienner Publishers. p. 168. ISBN 978-1-55587-954-9. ^ Hopkirk, Peter (1984), Setting the East Ablaze, London . ^ Kandemir, Feridun (1955), Enver Paşa'nın Son Gũnleri (in Turkish), Gũven Yayınevi, pp. 65–69 . ^ Suphi Bey, Yaver (2007), Enver Paşa'nın Son Günleri (in Turkish), Çatı Kitapları, p. 239, ISBN 978-975-8845-28-6 . ^ Melkumov, Y, "Interview", Novoe Vremya (in Russian), AM . ^ Melkumov, Ya. A. (1960), Туркестанцы [Memoirs] (in Russian), Moscow . ^ "Civil War in Central Asia", Ratnik . ^ Kedourie, Sylvia (13 September 2013). Seventy-five Years of the Turkish Republic. Taylor & Francis. p. 65. ISBN 978-1-135-26705-6. Moorehead, Alan (1997), Gallipoli, Wordsworth Editions, p. 79, ISBN 1-85326-675-2 . Woodward, David R (1998), Field Marshal Sir William Robertson, Westport, CT & London: Praeger, ISBN 0-275-95422-6 . Wikimedia Commons has media related to Enver Pasha. "Enver Pasha" . Encyclopædia Britannica. 31 (12th ed.). 1922. p. 5.